The beautiful blue Atlantic Ocean is captivating from your private oceanfront balcony at Hyperion Towers. This is a North Myrtle Beach resort that is on the oceanfront. It is located near the salt marsh in the Cherry Grove section of North Myrtle Beach, SC, which means the ever popular Cherry Grove Fishing Pier is really closely located to this North Myrtle Beach resort. And the sparkling blue swimming pool is right downstairs on the beachfront pool deck of Hyperion Towers. Stay on the oceanfront in these two-, three- and four-bedroom North Myrtle Beach vacation rentals. There are several floor plans from which to choose at Hyperion Towers. 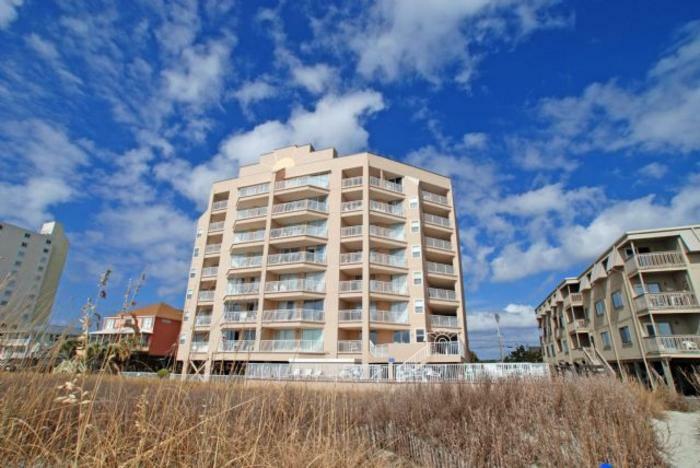 The two-bedroom North Myrtle Beach condominium has two baths and sleeps six people. The three-bedroom North Myrtle Beach rentals have two baths and sleep six or eight people. And the four-bedroom condo in North Myrtle Beach, SC has three baths and can accommodate 10 people. Just choose whichever size meets your family’s needs. Hyperion Towers is a mid-size North Myrtle Beach resort. There are seven floors of North Myrtle Beach rentals and only six North Myrtle Beach condominiums per floor. It is nice to spend a North Myrtle Beach vacation with your family in a resort this size. It means more peace and quiet for your family while you enjoy beachfront views and an oceanfront pool deck. The sun deck at Hyperion Towers also has a grill area with a table and chairs. Take burgers and hot dogs down to the oceanfront sun deck and enjoy the views while grilling lunch or dinner for your family. Grab a chaise lounge chair and take a nap in the sunshine while you work on your tan. It is a tough job, but when you vacation in North Myrtle Beach, SC relaxing on the beachfront is something that must be done. Elliott Beach Rentals is not affiliated with onsite management or the HOA of Hyperion Towers.